Report claims that in addition to 'classic' model, another model with highly-advanced capabilities delivered to Syria. Russia has reportedly delivered an even more advanced anti-aircraft system to Syria than the S-300 systems it transferred at the beginning of the month, the Russian news site Izvestia reported Friday. 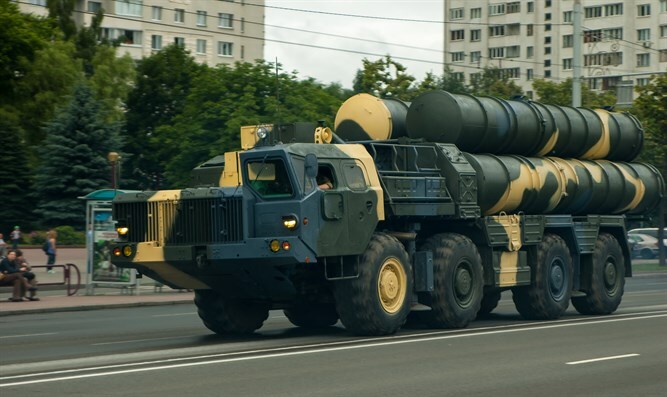 According to the report, in addition to the "classic" S-300 anti-aircraft systems transferred to Syria, Russia has also moved three S-300PM-2 systems into the country. These systems, the report said, differ from the classic model in that they possess more advanced radars and target identification abilities, as well as a mobile command center. The systems can also reportedly intercept the most advanced fighter jets and medium-range ballistic missiles of up to 155 miles, and are capable of defeating electronic warfare systems. Sources in the Russian defense ministry denied to the newspaper that Iranian forces in Syria are operating the S-300PM-2 system, which they said only Russian forces know how to operate. The Iranians, the sources said, are in possession of older systems. Last month, Russia announced it would upgrade Syria’s anti-air defense network and send the S-300 system there, following the downing of a Russian military aircraft in Syrian airspace. Russia blamed the incident on Israel, claiming that Israeli fighter jets flying overhead for an airstrike on a military research facility had caused Syrian defense systems to fire on the Russian plane. The IDF denied being at fault for the incident, and subsequently sent a delegation to Moscow which stressed that the Syrian anti-aircraft fire was carried out “irresponsibly” and that Israeli jets were already out of the area when the Russian plane was downed.